Exotic hawkweeds are relatively new invaders to the Pacific Northwest and southern Canada. Introduced from Europe into North America in the late 19th century, exotic hawkweeds were reported in the Pacific Northwest as early as the 1920s and became more common by the mid-1950s. Although there are 14 exotic hawkweeds in western North America, eight are relatively common in the Pacific Northwest. Orange hawkweed (Hieracium aurantiacum) is easily recognized by its bright orange flower. Mouse-ear hawkweed (H. pilosella) has a single yellow flower and is found in coastal Washington and Oregon, and southeastern British Columbia. Other exotic hawkweeds have multiple yellow flowers and are more difficult to distinguish from one another. The term “meadow hawkweed” often includes both meadow hawkweed (H. caespitosum) and king devil hawkweed (H. floriundum), a species that may have resulted from hybridization between H. caespitosum and H. lactucella. The two species are very similar in appearance [BOX 1]. Basal leaves of king devil hawkweed do not have hairs on the upper sides of the leaves and may have a grayish wax on the surface that rubs off. Exotic hawkweeds are poor competitors on sites with fertile soils, perennial grass cover and minimal disturbance. However, once established on disturbed sites exotic hawkweeds may quickly develop into a patch covering a site with a solid mat of rosettes. Selective herbicides such as Milestone® herbicide have shown to control hawkweeds and release grasses and desirable native forbs. Strategically timed herbicide applications can improve hawkweed control and promote establishment and maintenance of grass cover. Field studies were established on meadow hawkweed at two sites near Santa, Idaho by Dr. Tim Prather, University of Idaho. The objective of the study was to evaluate meadow hawkweed control with Milestone applied at four hawkweed growth stages, and measure the response of Idaho fescue (Festuca idahoensis) and other perennial grasses to the herbicide treatments. Milestone at 5 and 7 fluid ounces of product per acre (fl oz/A) with a non-ionic surfactant was applied in September (senescence) and November (fall rosette) , and May (spring rosette) and June (bolt) (Table 1). While a nonionic surfactant was used in this study, prior research on surfactants could not detect differences among surfactants suggesting that ammonium sulfate or a blend of organosilicone plus methylated seed oil worked as well as a nonionic surfactant. The experiment was designed as a randomized complete block with four replications of each treatment. Evaluations of cover and biomass were conducted in July, 13 to 22 months following application. Data were analyzed with Tukey’s Studentized Range HSD (P=0.05) and pooled across the two sites. Cover - Meadow hawkweed cover was significantly lower with Milestone at either 5 or 7 fl oz/A applied at the spring rosette (May) or bolt (June) growth stage when compared to later application timings (Figure 1). There was no significant difference in meadow hawkweed, Idaho fescue, or perennial grass cover between Milestone at 5 or 7 fl oz/A when applied at the spring rosette or bolting growth stage. Spring applications of Milestone® were associated with a significant increase in Idaho fescue cover, likely in response to removing hawkweed competition. At the senescent growth stage (September) Milestone at 7 fl oz/A provided significantly better hawkweed control than the same rate applied to fall rosettes (November). Milestone applications made at the senescent, spring rosette, and bolting stages resulted in significantly lower meadow hawkweed biomass compared to untreated plots. Treatments applied to spring rosette stage resulted in greater perennial grass biomass than untreated plots (Figure 2). Spring applications of Milestone were associated with a significant increase in Idaho fescue (above) cover, likely in response to removing hawkweed competition. 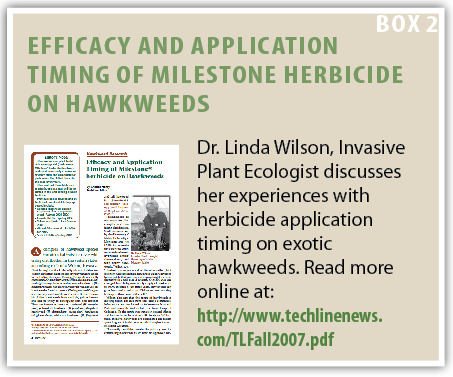 Results of these field trials are similar to previous studies with Milestone and indicate that herbicide application timing is critical for controlling exotic hawkweeds (BOX 2). Milestone at either 5 or 7 fl oz/A should be applied in the spring to hawkweed at the rosette growth stage to early flower growth stage to maximize exotic hawkweed control and increase desirable grass production. Milestone herbicide is not registered for sale or use in all states. Contact your state pesticide regulatory agency to determine if a product is registered for sale or use in your state. When treating areas in and around roadside or utility rights-of-way that are or will be grazed, hayed or planted to forage, important label precautions apply regarding harvesting hay from treated sites, using manure from animals grazing on treated areas, or rotating the treated area to sensitive crops. Consult the label before purchase or use for full details. Always read and follow label directions.